OTR Residents view the artwork at the art gallery opening on Thursday. Although the gallery opened in 2014, this is the second time the gallery will feature artwork by OTR residents. 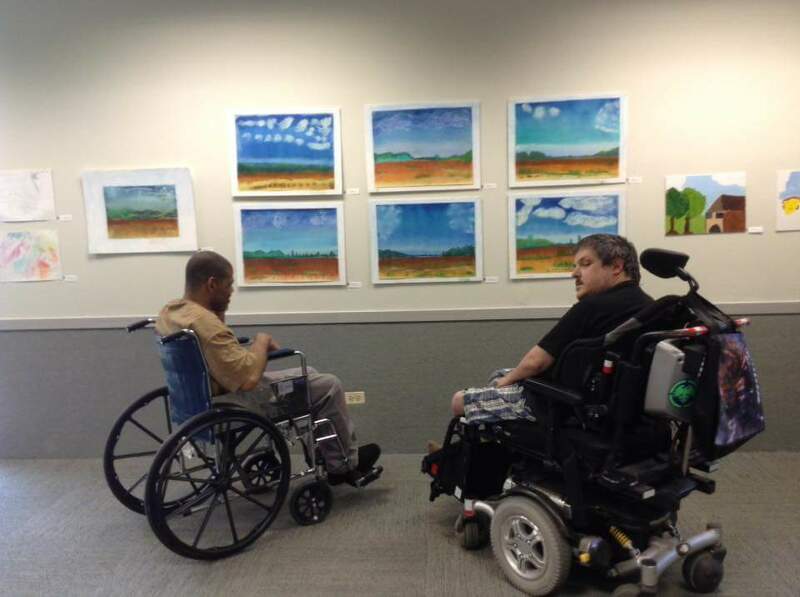 A local organization displayed the artwork of about 10 residents with physical disabilities at its second annual resident gallery opening Thursday at Hill Arboretum Apartments. Over the Rainbow Association, which was founded over 40 years ago, started the gallery in 2014 after a renovation of its offices, the organization’s CFO Les Russo said. OTR is a non-profit organization that provides accessible housing for individuals with physical disabilities, he said. “This is a way to get people to come into our building, to learn about OTR (and) to see what we do; it gives artists the opportunity to show their work … and it gives the neighborhood … the opportunity to come out on a Friday night and see artwork,” Russo said. Although the gallery has been around since 2014, June’s showcase is only the second annual gallery opening presenting OTR’s residents’ artwork, said Kaitlin Lavelle, OTR’s Manager of Individual Giving. Typically the gallery features artwork by local artists, Lavelle said. Several of these artists came back to offer free art lessons to OTR’s residents, and OTR decided to have their first resident-only gallery last year to showcase their artwork. Residents were also offered lessons through a partnership with the Evanston Art Center, Lavelle said. She said a major goal of the classes was to get the residents out of the apartments and actively involved in the community. “A lot of them do attend our regular art shows, so we kind of wanted to give them an art show themselves and help them to get their minds moving and get them thinking creatively,” she said. The gallery features artwork of several different mediums including acrylic paint, pastel, mosaic, photography and ink, Lavelle said. Instead of putting up artwork permanently, OTR’s gallery features a different local artist’s work about every month, Russo said. A portion of each piece of artwork sold is then donated to OTR’s Resident Services Program, according to the organization’s website. Russo said it has been a “wonderful program” that has allowed residents to appreciate art more deeply and lead more fulfilling lives. Jody O’Connor, the curator of the gallery, said that during the gallery opening, the artists have the opportunity to speak about their pieces and their experiences creating art which can be especially moving.